YouTube's player added a new button for playing a vuvuzela sound file. If you watch the World Cup football matches on TV and you're missing the loud vuvuzela noise when you're watching YouTube videos, there's a new button for you. "The vuvuzela is a typical 65 cm (2 ft) plastic blowing horn that produces a loud, distinctive monotone B♭3 note. The vuvuzela is most used at soccer matches in South Africa, and it has become a symbol of South African soccer as the stadiums are filled with its loud and raucous sound that reflects the exhilaration of supporters," informs Wikipedia. Unfortunately, if you click on the vuvuzela button, you might not be able to hear the original sound of the video. 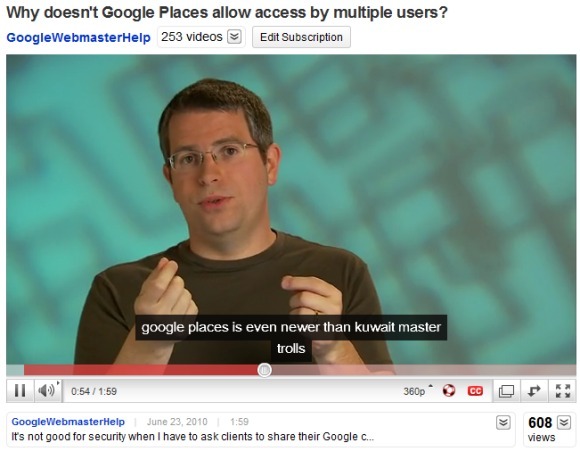 YouTube has an option that provides automatic captions for videos, but the results are rarely accurate. Isn't it a little late for april fools? You know what would be great? That when you press it, everyone across the world who's also watching the video should also here it. Eheh.. congrats! while the rest of the world is trying to develop a reliable "Vuvuzela-filter".. reverse.. ops. inverse engineering? To the rest: get some sense of humor, will you? IS there a url parameter to link to vuvuzelafied vids? It has too be one of the most irritating sounds I have ever heard.